Perhaps it’s the result of an anxiety! There’s also a new Mad max film coming out soon, Tom Hardy playing the titular role; hopefully it’ll live up to this early classic venture. I’ll revisit this one again though… those big Zed’s are a powerful good moto! One of the links I have on the block is The Selvedge Yard; a mix of “artistry, anarchy, alchemy & authenticity.” The hipsters hop, the cools chill. Plenty of items about things the man of the world should know about. They have a smart piece of attire available that no self respecting lad should be seen in. Flat caps are in; Bonneville’s are in; expletive t-shirts? Nope! Nevertheless go to their brother blog NBWS and enjoy the iconic imagery. Neat stuff if I do day so myself. Honey! Let’s pack the bags and hit the road! 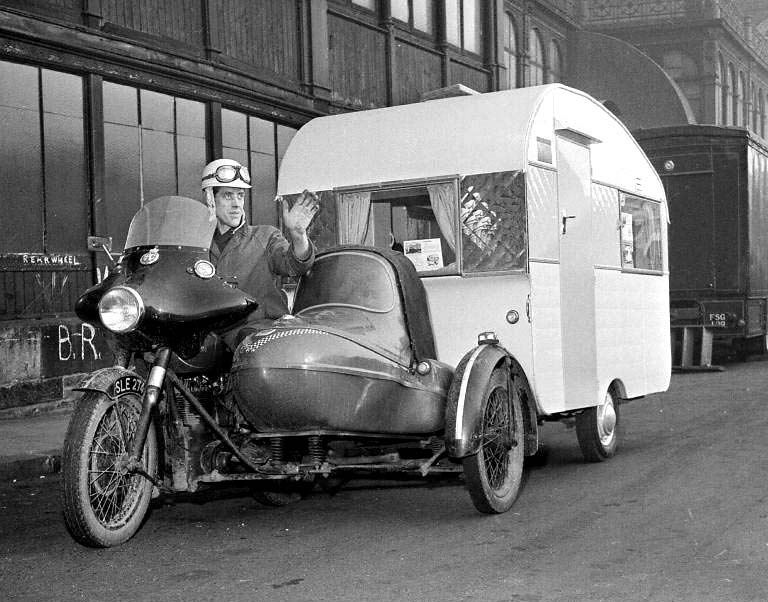 A combination and caravan in tow. The highway can be our home. I can’t see speed being important; it’s the journey that counts. But I’d bet there’d be a hefty tailback. Hare’s must rank as one of the wiliest of animals: the ears of a rabbit, whiskers of a cat, pace of a greyhound, attitude of a lion. They gave rise to the Brer Rabbit stories through the ‘Trickster’ tales brought from Africa; the christians took over Pagan symbolism of the goddess Ēostre who symbolised spring with the hare transformed into the easter bunny as well as the use of eggs then too (the crucifiction has nothing to do with easter, bunnies and eggs). Now where were we? A BSA single rushing along at a good clip with the English hedgerow whistling by at a blur can be seen to be ‘haring’ along: the verbisation of our Lepusian pal. 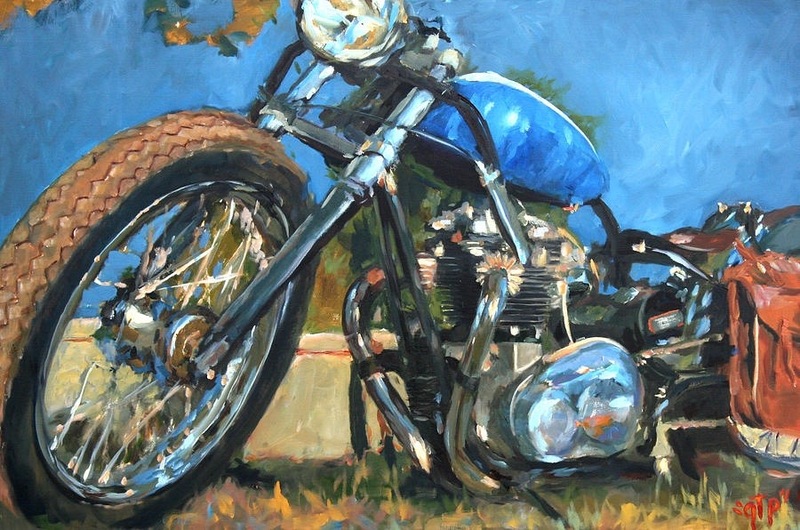 So when I spotted this custom BSA single dressed up in a spare frame akin to our sinewy coursing friend, I knew we had the moto embodiment of our Mad March Haigha. Time for tea? Why it’s always time for tea! Fair fa ye honest sonsie face…. 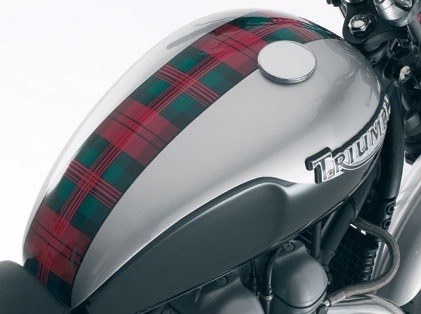 In celebration of the Scottish bard’s birthday, Rabbie Burns, I have this haggis looking Bonneville tank complete with a tartan banding. As never a poor sinner had been out in. Long before one Don Maclean wrote That song the boys were having a great time riding a wave of youths popularity. After a long tour in May 1958 they took a side trip from Lubbock to Dallas to pick up some mo’orsickles. 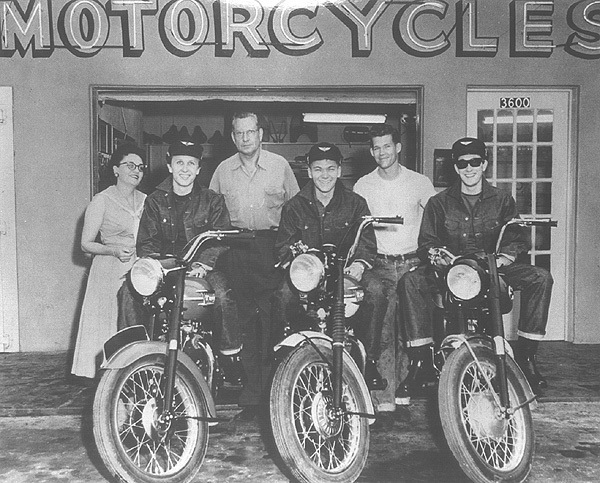 The Harley D dealerships told these young whippersnappers not to touch their machines; across town at Ray Millers Triumph showroom they received good enough treatment to pick up a few of the latest models of Brit Iron available at that time. Buddy took an Aerial Cyclone; J.I. 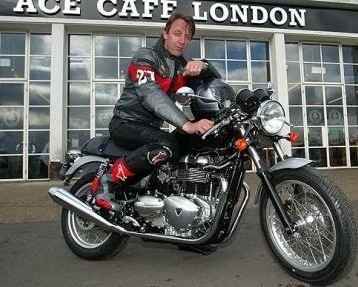 a Triumph Trophy; and Joe B a Triumph Thunderbird. Story goes they then rode ’em back across town to the Harley dealer to show off their new rides, then hauled along the highway to Lubbock some 350 miles away. I bet they were singin’ all the way! The Aerial eventually made it to the Waylon Jennings estate; as you know he gave his seat on that fateful flight to Buddy. 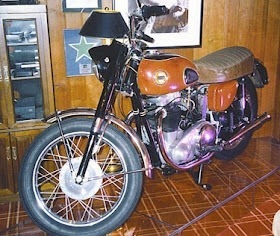 It’s a nice looking bike fit for one if the true founders of rock ‘n’ roll. 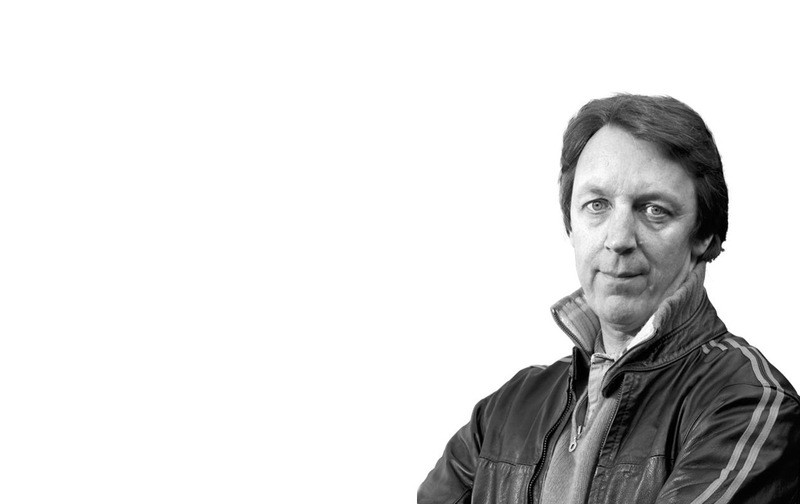 A giant of Moto-journalism was lost yesterday: Kevin Ash. On a BMW press release in South Africa, his luck ran out and was killed in an accident. 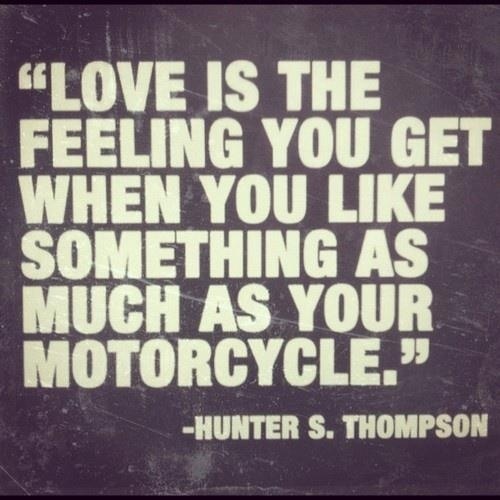 He was a force in the truth of the world of two-wheels garnering respect with his riding and writing peers alike. 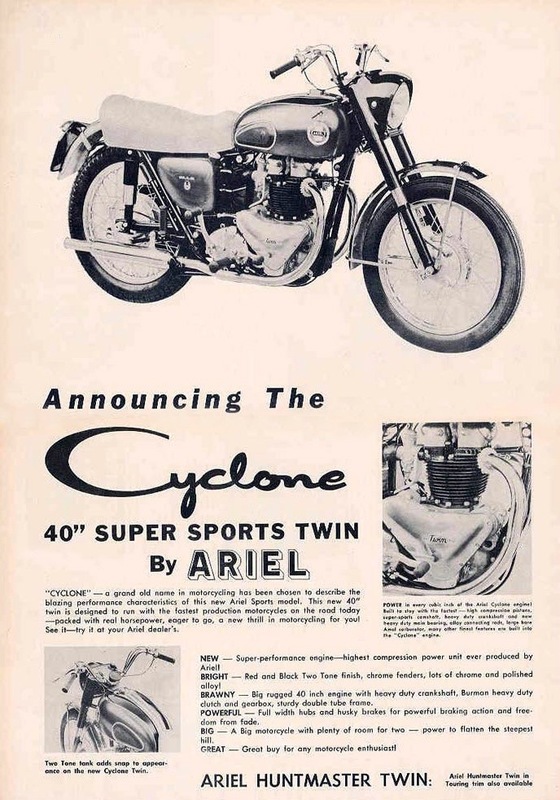 He was an unassuming well-liked correspondent for the Daily Telegraph, having been there for 15 years, before that a contributor to Motorcycle News. His website Ash on Bikes is a truly useful source of information for up to the minute Moto-reviews. Today saw me one step closer to my US naturalization: fingerprints taken, mugshot snapped and an FBI background check commenced. So to commemorate this event here’s a shot of another Brit abroad: Hugh Laurie on his Bonnie with Stars and Stripes lidded passenger. 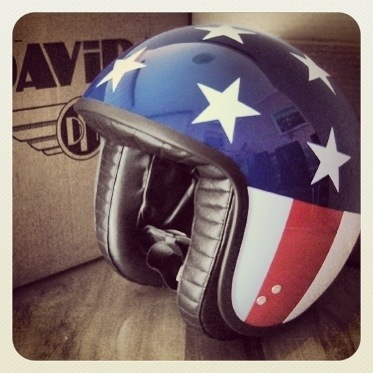 Hmm, I wonder… A Captain America helmet? The Rebellion are making a last stand against the Empire. 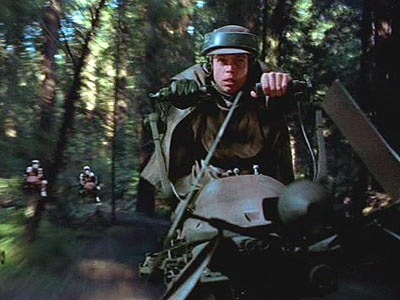 The forest moon of Endor is the battlefield; only the highly trained assassin of the Scout Stormtroopers stood between the small party of rebels and the Death Star defense shield transmitter base. 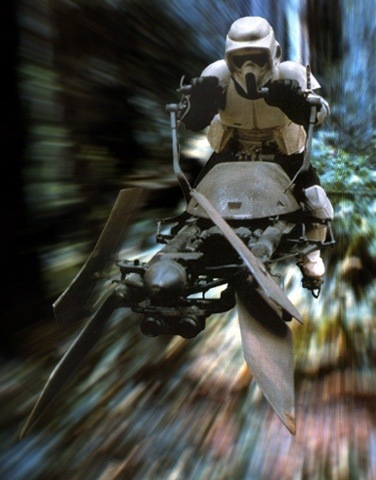 Their method of zooming around the understory of the woods was atop a 74-Z Imperial Speeder Bike manufactured by Aratech Repulsor Company. 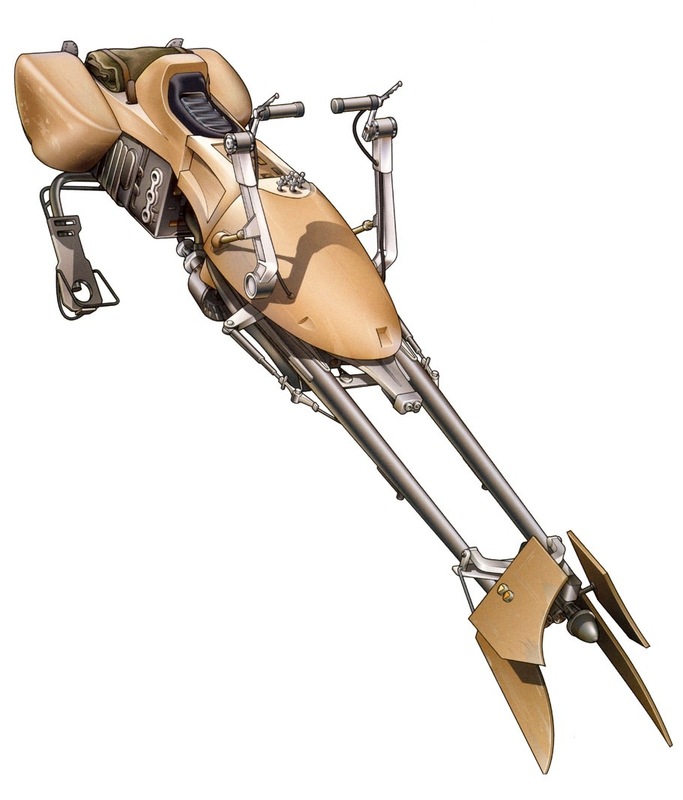 It was armed with a blaster cannon, could speed up to 500 km/h on turbo for short distances; but only had a ceiling of 25m. ―Joke told by Rebel strike team forces on Endor. 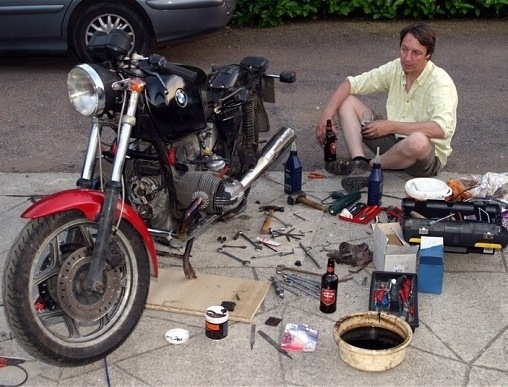 In the work to upgrade the stopping power of the front end of the Bonnie I’ve had to strip, clean, renew seals and reassemble the mechanicals of the proposed disc system. The master cylinder bore was polished out with a piece of green pan scrubber on a home-spin mandrel. The caliper recesses brushed out with a Dremel mounted brush and all items scrubbed down and seals pre-soaked in brake fluid. 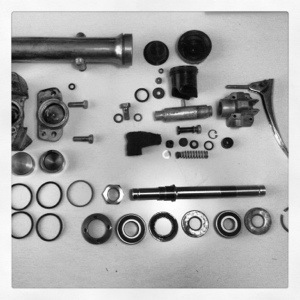 Assembly was straight forward apart from an awkward inner circlip that slipped and sprung the inner workings of the masters piston gubbins across the kitchen… Hope it all goes on the bike as easy! 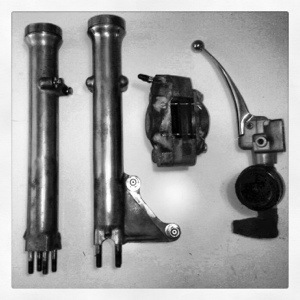 Blog Post Script: One of the bearings was too small ID for the axle to install…. “Made in China”. 0.5mm too small! No amount of coaxing or freeze-shrinking would get it in. So I’ve ordered Japanese sealed bearings instead. I want these puppies to work once rolling! 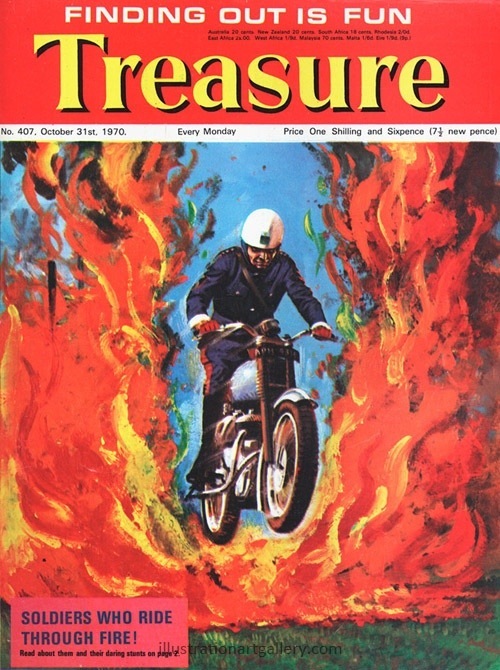 Real life action for boys: a Royal Signal Corps rider bursts through the cover amidst a ring of fire. We’ve covered them before in this blog but I love the period appearance of this magazine. It was the end of old money 1s6d is the new 7 1/2pence. 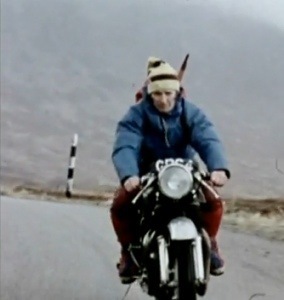 Mountains and Motorcycle: this just cropped up on the Interweb of late. 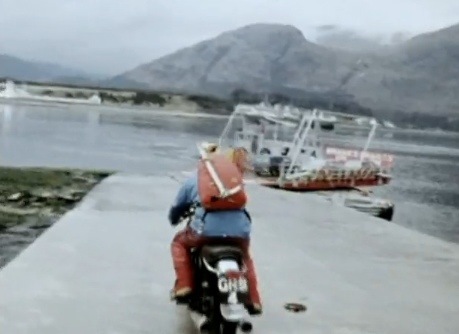 A short film from National Geographic in 1976 filmed quite expertly by Yvon Chouinard. It shows John Cunningham riding across the moors and glens of the Highlands towards an icy escapade on the big bad Ben Nevis. It’s tricky to see the model but it’s a Triumph with pre-unit engine. But the clip-ons, big tank, and able handling on the single lane roads show a serious rider. His wooly had is tied on with string… No lid for this jock; he’s ‘ard! He even catches the Ballachullish ferry across Loch Leven. The Bens of Lochaber loom behind. 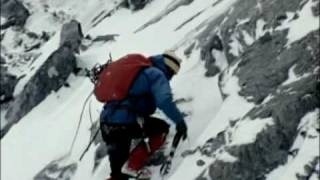 He tramps up the slopes to the looming Ben Nevis and heads up at speed over lower snow covered rocks, donning his crampons when the grade gets more serious. A pair of technical ice tools and his front points the only precarious purchase. But a sure placement of all makes this movement look all too easy. 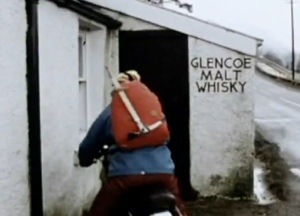 After storming up to the summit he descends at a knee-popping pace back to the Triumph and torts off to the nearest ‘establishment’ to enjoy a warming dram or two and most likely a noisesome céilidh.